Safety is always a concern when a retail employee is closing or opening a store alone. With the Centronex Retail Employee Safety Service (CRESS), a wearable tag that connects to an employee’s smartphone can alert a network of responders by the push of a button if a dangerous situation occurs. Responders receive GPS information about the employee’s location and can listen in to an audio feed coming from their smartphone. 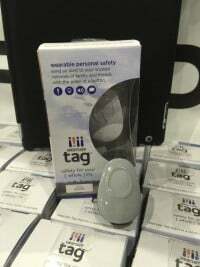 The WearSafe Tag is capable of sending email, text, and push notifications. In addition, the tag provides discreet haptic feedback to the employee that the request for help has been received. For more information about the WearSafe Tag, click here. For more information about Centronex, click here.